1 - Chester Valley Trail Phase 1 - PA Recovery (stimulus) website indicates that a contractor has been selected and construction will begin in October for a two mile section from Rt. 29 to Church Farm School Rd. Cosntruction is expected to be complete by next summer. 2. - North Delaware Greenway - A report in today's Inquirer describes construction as the Greenway as "soon" but in reality it looks like most of the construction will take place in 2010. The first segments include a sidepath along the Delaware Avenue Extension from Lewis St to Bucryus St and construction could begin this fall. A section of the K&T Trail from the Frankford Arsenal Boat Launch to the Tacony Park Boat Launch should begin in 2010. A third section in Torresdale section of the city known as the Baxter Trail could also be constructed next year. In all 8 of the 11 miles of the North Delaware Greenway should be complete in 2011. 3. - US 202 Parkway- Construction of the Multi-Use path is folded into the US 202 section 700 project from Montgomeryville to Doylestown. 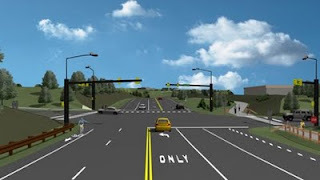 If we believe the drawings on US 202.com the parkway will also contain Bucks County's first on road bike lanes. The first section has been under construction for 9 months, while the second segment of construction will begin next month. The trail and the parkway are scheduled to be completed in December 2011.